Updated Thursday May 4, 2017 by AUBL Miami. AUBL Miami Semi-Pro Baseball playoffs start this Sunday 5/7/17! There will be 4 very exciting games. 3 games will be broadcasted. The Miami Storm were National League runner-ups in Spring 2016, but needed some help on the final day of the season just to earn the playoff bid in the Fall 2016. The North Miami Orioles defeated Las Aguilas last weekend to give The Miami Storm the 6th and final playoff spot. Pitching has been solid for the Storm. Aldo Morales (3.38 ERA) and Scotty Boras (1.80 ERA) have been very consistent. Bino Garcia leads the way offensively, hitting .462 this season, while Nick Silva and Andy Celaya have provided the power hitting 2 homeruns apiece. 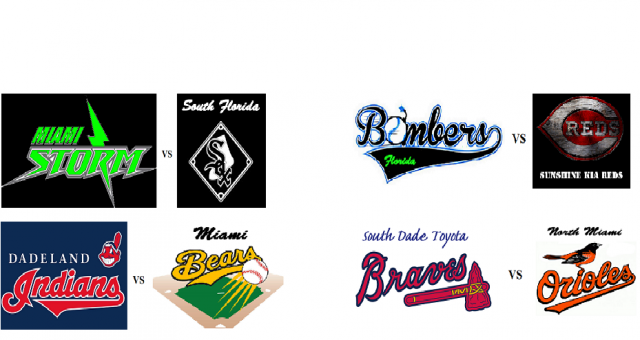 The South Florida Sox are a scrappy team that have played very well this season. Mike McGinnity has been the workhorse on the mound for The Sox (39.2 IP, 3.18 ERA). Stephen Rozenman has also pitched well (20.1 IP, 3.98 ERA). Offensively, The Sox feature a balanced attack, with Anthony Garce leading the charge with a .459 AVG and 2 homeruns this season. 9 Sox hitters hit .350 or better this season! The Dadeland Indians rode the wave on the arm and bat of Mario Figueredo this season (46.1 IP, 2.53 ERA), (.500 AVG). David Palma (.417 AVG) and newcomer Kevin Miller (.455 AVG) have played very well. Solid catching from Ubbie Urrutia and good all around play from Brett Klasko and Gio Ayala have been keys for The Tribe this season. The Miami Bears pitching has been led by Orlando Aponte (55 IP, 3.87 ERA). David Weiss has destroyed AUBL Miami pitching this season, hitting .667, 1 HR. Anthony Garcia not far behind (.513 AVG). The catching of Gabriel Rodriguez has been a large factor in The Bears' success, both on defense and offense (.415 AVG). These 2 teams fought to the wire back in January, with The Bears outlasting the Indians with a walk-off in the 9th inning! Florida Bombers pitching triumvirate of Nick Cruz (20 IP, 2.25 ERA), Jordan Vera (26.2 IP, 4.39 ERA) and Johan Bravo (28 IP, 3.54 ERA) have been solid all season. The bombers are a young, fast squad that puts pressure on the opposing defense. The Bombers have 4 players hitting over .500 (Dimitri Duverger, Willie Donner, Christian Alvarez and Richard Nunez). The Reds have had an up and down season, but make no mistake, this team is still the returning champs! Pitcher Michael Rudman is still one of the most feared pitchers in the league, and has had great success in playoff competition. Last season's batting champ Daniel Oliveri led the offense again this season with his bat and his speed. The South Dade Toyota Braves (formerly Team Venezuela) have had a rich tradition in AUBL Miami. This season, after starting 1-5, The Braves have righted the ship (won 7 straight). Pitching, defense and timely hitting have gotten the Braves back to their usual winning ways. William Arroyo, Luis Capriles and Marco Perreira are all hitting over .400 this season. Ricky Ibarz has recovered from injury and pitching like he did in 2014 and 2015. The North Miami Orioles have been tough to beat this season. Deuris Ventura and Anthony Aragon have been consistent on the mound. Homerun derby champion Rodnel Bell oleads the offense with a gaudy .639 AVG. Jose Solano has also had a great season, hitting .452. The Orioles have a dynamic offense and will typically try to outscore it's opponents in offensive shootouts.